Sharing in the joy of couples as they begin life together in a Christian marriage is one of the most meaningful ministries at Westminster. A wedding is a sacred occasion filled with many blessings. In the simple marriage rite, the blessings of family, of friends, of the gathered community and of God are brought as gifts to this momentous moment in the lives of the wedding couple. Guidelines have been established by the Session to help couples create a service that will express their personal needs and will also reflect the integrity of a service of worship in the Presbyterian Church (USA). The aisle is 125 feet long and the sanctuary has 56 pews. Brass candelabra and pew candles are available. 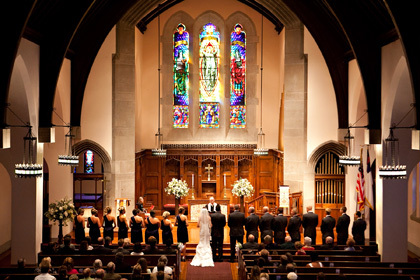 Couples who are interested in being married at Westminster may contact the Church Office (217-522-4415) for more information, the fee schedule and to check date availability.